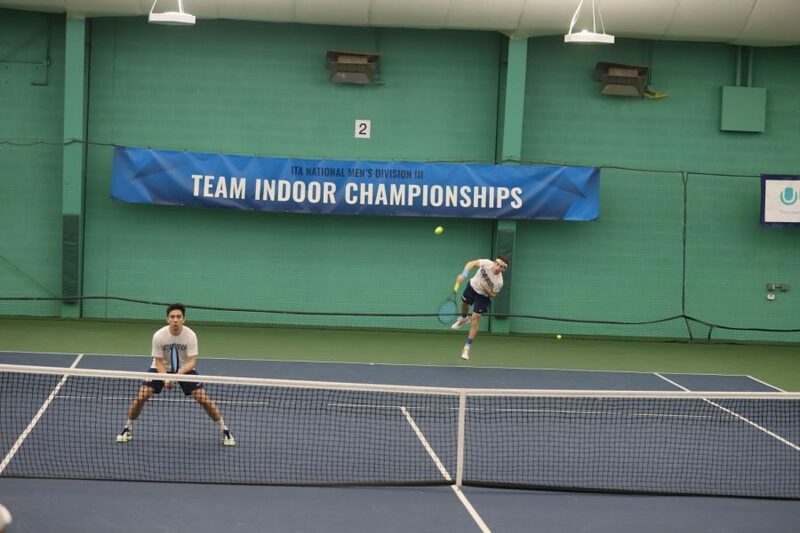 Third-year Spartan Anthony Kanam and second-year teammate Jonathan Powell compete in doubles at the ITA Indoor National National Championships. The men’s tennis team finished the Championships with one win and two losses, bringing their season record to 5-2. On Saturday, Feb. 23, the Case Western Reserve University women’s tennis team competed against Indiana University of Pennsylvania (Indiana) at the Cleveland Skating Club. The team walked away with a win, bringing their season record to 2-1. To start the night, Indiana took an early lead with a win in second doubles where first-year students Sneha Karnam and Nidhi Jha fell 8-7. The Crimson Hawks beat out second-year Spartan Mira Amin and first-year teammate Shreyaa Mukund 8-4 in third doubles. The Spartans claimed their first victory of the night in first doubles. Second-year teammates Madeleine Paolucci and Nicole Cardwell defeated their opponents 8-4, bringing the overall score to 2-1. Singles contests followed, and the Spartans claimed victory after victory. To start, Mukund claimed sixth singles. Karnam and Cardwell were victorious in second and third singles, respectively. A win at first singles by Paolucci followed. To finish up the singles play, Amin claimed fourth singles and Jha defeated her opponent at fifth singles. The successful singles play earned the Spartans the win for the day, 7-2. The following day, the women headed to Medical Mutual Tennis Pavilion to take on Cleveland State (CSU). The Division I opponent proved a difficult challenge, and CWRU ultimately fell to CSU 7-0, bringing the team record to 2-2. The women return to action on Saturday, March 2. The team will be taking on Division I DePaul University at the Cleveland Skating Club. The Spartan men’s tennis team also saw action over the weekend, competing in the 2019 Intercollegiate Tennis Association (ITA) Indoor National Championships. To start the weekend off, the Spartans competed against the University of Chicago on Friday, Feb. 22. The day ended in a 6-3 loss for the Spartans, the first loss of the season for CWRU. The Spartans started with an early lead, winning two of their three doubles contests. Third-year Spartan Anthony Kanam and second-year teammate Jonathan Powell defeated 8-3 at first doubles, and third-year student Zach Hennessey and second-year student Matthew Chen also won their doubles contest, finishing 8-5 at second doubles. 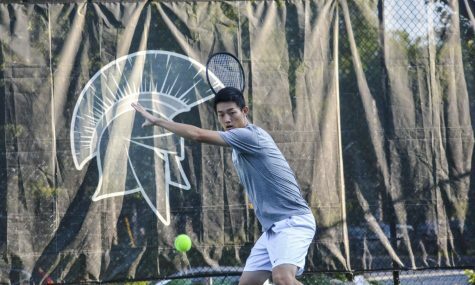 In singles play, the Spartans struggled, winning just one of the six contests. The lone win came from fourth-year Spartan Rob Stroup. The following day, the Spartans faced Carnegie Mellon University (CMU) in the consolation semifinals. The 18th ranked Spartans defeated their 10th-ranked opponents 5-4. The day started with doubles play, where the Spartans won all three contests to grab an early lead. Starting at second doubles, Hennessey and Chen claimed an 8-5 win over their CMU opponents. 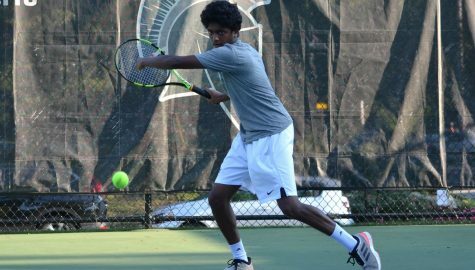 First-year students Aaron Umen and Chaitanya Aduru teamed up to claim a win after going into a tiebreaker in third doubles. First doubles also went into a tiebreaker and Kanam and Powell were able to walk away with the victory. In singles, Powell won at sixth singles after the Spartans lost the first three singles matches. Umen fell behind in third singles, but was able to come back and win in a tiebreaker. The final singles match, fourth singles, was played by first-year Spartan Max Vicario. The contest ended in a loss for Vicario, but the Spartans had already clinched the win over CMU. The final day of the ITA Nationals was Sunday, Feb. 24. The Spartans placed fifth after a loss to eighth-ranked Gustavus Adolphus College (GAC). The end of the weekend brings the Spartans’ record to 5-2 for the season. The men will return to action on Saturday, March 9 after two weeks off.